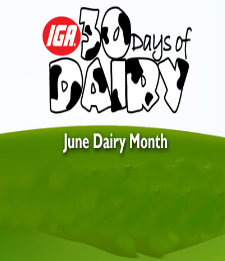 IGA 30 Days of Dairy Sweepstakes – Win a $25 IGA grocery gift certificate! Win a $25 grocery gift certificate (4 winners)! ENTER SWEEPSTAKES HERE – IGA Sweepstakes page. ELIGIBILITY – Open only to legal U.S. residents and the District of Columbia who are 18 years old or older as of date of entry. SWEEPSTAKES ENTRY PERIOD – The 2018 “IGA 30 Days of Dairy” Sweepstakes begins at 12:00:01 a.m. Central Daylight Time (“CDT”) on June 1, 2018 and ends at 11:59 p.m. Central Daylight Time (CDT”)on June 30, 2018.